Our Android apps are available for purchase via the official appstores listed below. Please click one of the linke below to be taken to the app store page for tha app you are interested in. Most Android users should select a Google Play link below, not Amazon. 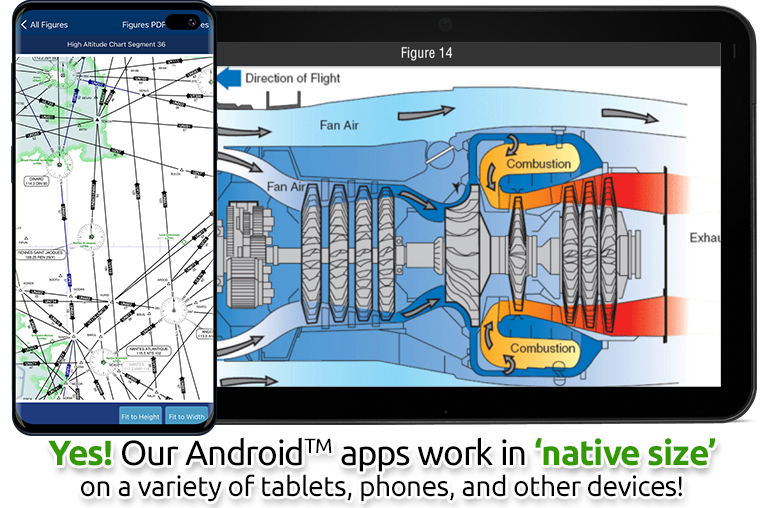 In addition to our PC, iPhone™ / iPad™, and WindowsMobile™ offerings, you can now study for your EASA ATPL(A), CPL(A) and/or IR(A) theory exam using our GroundSchool apps on your Android™ device! 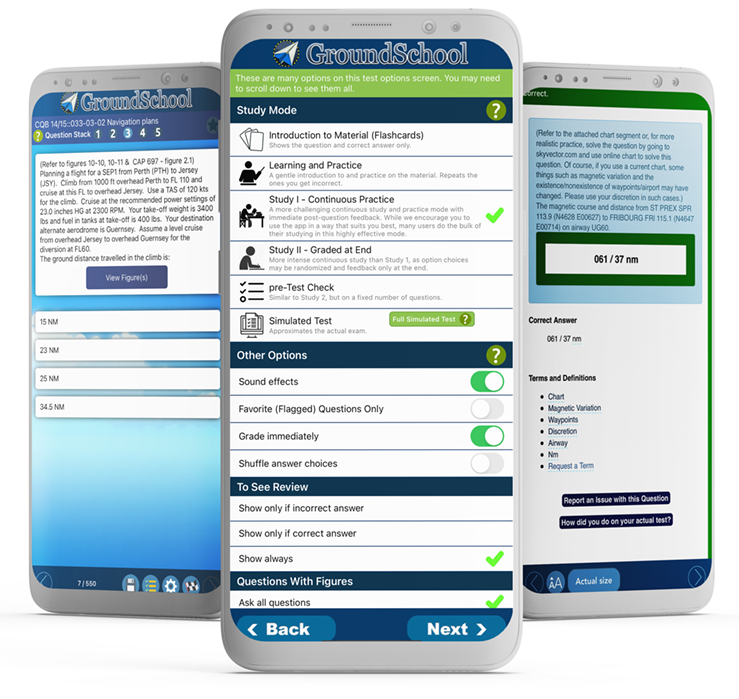 Compatible with all EASA classroom courses and all EASA-FCL/JAA-FCL syllabus programs. The apps are available via the Android Market™. Just click on one of the links above to learn more and/or to purchase. You can be studying on you Android device in no time! Yes! Each spp contains study material for all of the exams. 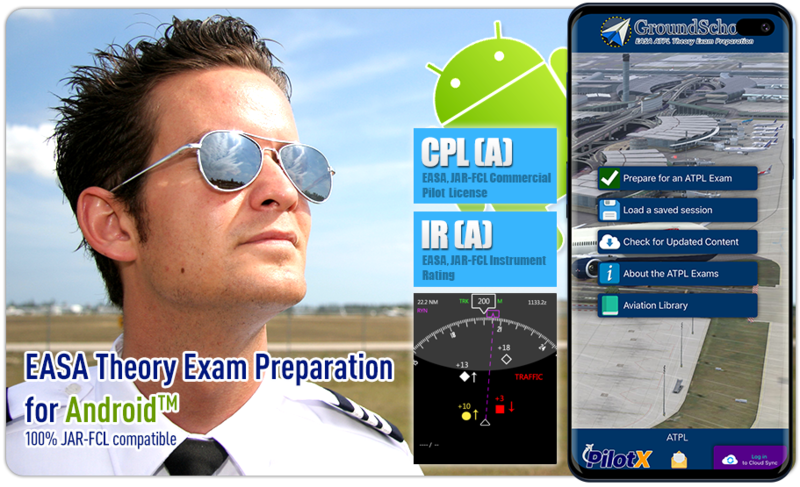 For example, the ATPL(A) (Airplane) title will help you prepare for all 14 EASA ATPL Airplane tests. Sorry, we do not have Android™ titles available for individual tests, but, the plus side is that the price for this Android™ versions are a bit less than for our PC software. Here's the really cool thing - the Android™ apps feature a built-in update mechanism. What this means is that with just a few clicks, our app will check the internet for updated data and download them to your device as necessary. This is integrated, fast, and free for those who have purchased the app. This helps ensure that you have questions consistent with recent CQB and actual exam practics. This puts our apps far ahead of competitors who rely on outdated, static datasets. No, you don't! Once an app is installed on your device (after you purchase it from the Android Market), you don't need to be actively connect it to use it. This means, for example, that you can spend your time in a passenger seat of an automobile or aircraft studying even when you don't have an active internet connection. Of course, you need to have an internet connection to your device to get updates from our servers from time to time, but as far as everyday use goes, you certainly do NOT have to be connected to the Internet.